Electrical Inspection & Testing in London, SE26 4DT. Covering South East and South West London. 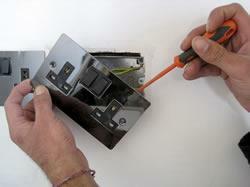 SE Electrical, an independent electrician with over 16 years experience. Specialising in small works, fault finding and repairs in domestic and commercial premises. All work is carried out by a JIB Approved Electrician and is tested, certified and completed to British Standards (BS7671). SE Electrical is Public Liability Insured and all work and materials are guaranteed for twelve months. A large stock of electrical accessories and materials are carried and emergency call-outs are available. No charge for quotes. Guide prices can be viewed on my website. For fast service and friendly advice call 07966 580033. "Kal is calm, confident and competent with a caring can-do attitude. It was so easy to work with him as his communication is excellent and he's very personable - had some great chats and tea breaks. This man will do exactly what he says he'll do, when he says, how he says and won't rip you off. Don't hesitate, he's just great. George." "Kal came over to install some lights (indoors and external) and to fix a faulty light switch. He was absolutely brilliant - very quick initial response to my query, very easy to a book a slot, and the work is outstanding. I would definitely use him again and would recommend him without hesitation!" "Very responsive, worked fast and charged a fair price. Highly recommended." "We were very impressed by the punctuality, professionalism and quality service provided by SE Electrical. Thank you Kal for a great job! We are really enjoying our new light fittings. We would highly recommend SE Electrical."